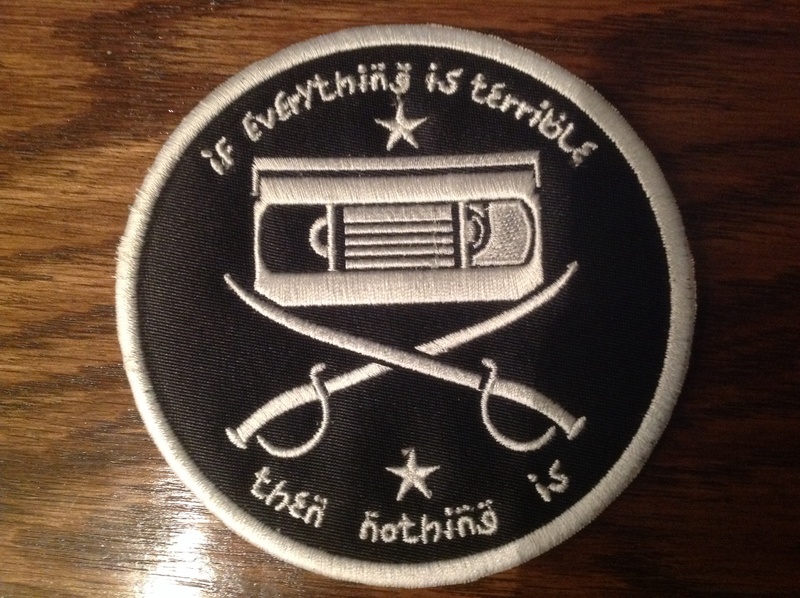 So we came to the final day of Everything Is Festival, the final night didn’t start until 6.30PM, so I had a lazy day not really doing anything except hitting a few stores near Cinefamily to look for Dickies trousers in weird colours, which produced zero results. The final night of the festival was a double bill of Rob Schrab & Dan Harmon’s Found Crap plus the documentary The Search For Weng Weng. It was a strange feeling walking into Cinefamily for possibly the last time, over the last 5-days it’s become home and I’ve tried to take in as much as possible and to join in everything here. I can remember our last night at the Alamao Drafthouse, Austin and feeling quite sad about it going away, but this time around I actually felt really fine, i’s had such a great time and met so many great people that it felt like having being here was actually the start of something, not the end. I wasn’t sure what to expect for the Found Crap, I know this has been a regular fixture if the festival over the years, but wasn’t sure what to expect. One of the many things that’s been great about the festival is that every show is different in format and style, so this one had a different format as well. Turns out that the Found Crap is a mix tape style show, with all the amazing clips cut together into one roughly 40-minute experience, which is added to by Rob keeping a mic and chiming in once in a while, he’s also got a laser pointer which is used hilariously to highlight additional oddities through the clips. This was a great comp and showed some great obscurities along with some great clips from more familiar films, including a great use of footage from Lethal Weapon 2. Then is was back into the patio for one last time, to chat with everyone and just enjoy the evening, what’s great is that I keep getting introduced to people and they’re always so cool. Got talking to a UK guy about how great Alex Cox’s intros to Moviedrome used to be and how no one in the USA knew about them, so he was super glad to chat to me about how he still had them on VHS here in LA, so great. it was funny that the closing film was The Search For Weng Weng, I’d had numerous chances to watch this in London, but for one reason or another I’d kept missing it, which turned out for the best as I’d now get to see it as the final film of the festival. The doc was great, I’m a big fan of when someone sets out on a quest to uncover some previously unknown story. Enjoyed this a lot and it’s style, subject and ethos was the perfect way to finish the festival. I wasn’t sure if anything was happening after the final film, but it turned out the patio was still open and that they needed as much help as possible to box up the 8000 Jerry Maguire VHS tapes that had been turned into a huge sculpture out the back. 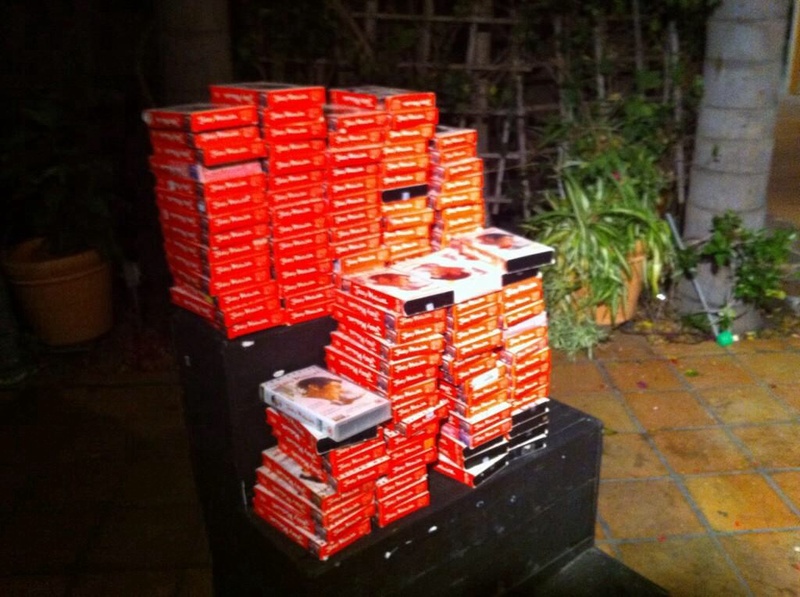 It was really quite surreal to help out doing this and to see so many people walking around with all these Jerry VHS tapes! It took a while but we finally managed to get everything boxed up and stored out the back of the cinema. They asked if anyone was free the next day to help load the boxes into a van, guess who’s free? ME! Yes so I’m heading back there later today to help Rem Lazar load everything up, it’ll be fun to be back at Cinefamily for one more time. So that was the end of the Festival, but not the end of my holiday, I’m going to keep writing these over the rest of the week, until I get back home. I was originally planning on heading to San Francisco over these last 4 days, but I hadn’t actually planned anything for this, it was more an idea, yesterday when I looked at prices for flights, hotel etc I realised it was going to cost me a lot more then I expect, so I’ve decided to stay here in LA, there’s a lot of cool people here who want to meet up over the next few days, so there’s actually a lot happening! I’ll write more about how I feel about the festival and my time here later on, but I will say it’s been amazing and so incredibly worth coming out for this, Cinefamily is so great, the festival is so fun and everyone has been so welcoming and made me feel so at home, it’s so good. An extra big thanks has to go to Merritt from Cinefamily for being the ultimate volunteer and looking after me so well and Everything Is Terrible’s Dimitri for being a total gentleman all the way through the festival, including the time he suggested taking me to a strip bar. I also have a new ambition, I want nothing more than to put on a show somewhere and have Dimitri and Evrim co-host it together, it would be the ultimate, they’re both so great at being hosts, I’d just love to see that happen!